Get excellent protection and coverage with Rust-Oleum Commercial C740 System 400 VOC DTM Alkyd Enamel. 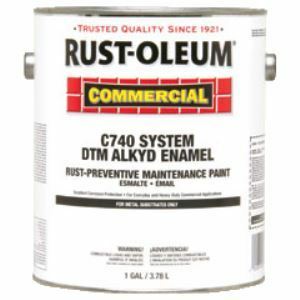 Get excellent protection and coverage with Rust-Oleum Commercial C740 System 400 VOC DTM Alkyd Enamel. This ready-to-use formula provides an easy-to-maintain, high-gloss finish specifically for commercial applications. For everyday commercial use-metal trim, structural steel, handrails, cabinets, etc. Achieve maximum performance by starting with the C740 System primer.